(Moon Voyage Records) 10 tracks. 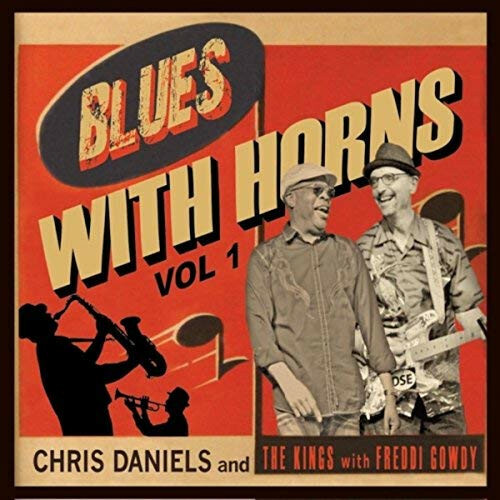 Blues With Horns grew out of their love for the classic sound of horn-driven soul and blues that Chris and the band noticed was missing in many of the festivals they played from South Carolina to Colorado. Comprised of new tunes like the Chris original 'Sweet Memphis' with guest slide-guitar wizard Sonny Landreth and Subdudes keyboardist John Magnie - to harmonica and horn laced treks to the backwood blues shacks of 'Fried Food/Hard Liquor'.This is a record that you will keep listening to over and over with new favorites for each road trip. Other gems are Johnny Guitar Watson's, 'My Baby Loves Radio', Freddi's 'Get Up Off The Funk' and a New Orleans romp through Elvin Bishops' 'Can't Even Do Wrong Right.' There are blues standards here from Sam Cooke, Buddy Miles, Walter Wolfman Washington and Bobby Blue Bland that Chris and Freddi bring to a whole new level. Songs like Cooke's 'Soothe Me Baby' that others have feared to attempt, Daniels and the Kings lovingly embrace and set free with a whole new energy. Customer evaluation for "Blues with Horns, Vol. 1 (CD)"